You can export documents from Lexbe and import them into inData's TrialDirector litigation software. 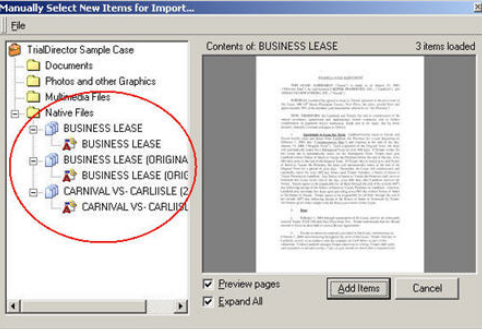 In Lexbe you will need to identify the documents you wish to export. There are a number of ways to do this. One way is to mark the documents you wish to export as 'key documents' in the Document tab of the Document Viewer and then filter on 'Key Documents' in the Browse view. A second way to do this is to use a custom tag for this purpose. Rename an unused custom tag as 'Export to TrialDirector' (Management>Manage Custom Doc Fields). Then tag all appropriate documents in the Doc tab of the Document Viewer. Then filter on the new 'Export to TrialDirector' field in the Browse View. In either case you might wish for the file name to be descriptive of the document in some fashion. This is because the file name will be imported into Trial Director and used to identify the document in that program. The next step is to export the filtered documents to your local computer. Export files for Trial Director You can do this by clicking on the 'Export' panel on the left of the page and then clicking on 'Export to Briefcase'. You will then see a prompt on where to save a Zip file that has been created with a name something like: Briefcase-c5086683-f60f-489d-8dfe-32a4a93fef10.zip. You should save this to a location on your local computer, such as your desktop. Then you should unzip the files in the briefcase and delete the one named File Index.xls (this file is created by Lexbe with links to versions of documents in Lexbe and on your local drive; it is not needed in TrialDirector). If you have created timelines in Lexbe you may wish to also bring these into Trial Director. To export Lexbe timelines, go to the timeline module (Analysis>Facts and Issues). Select the issue you wish to export and then 'Export to Word' or 'Export to Excel' from the button on the lower left, and save to the Briefcase folder that you used for your documents. Next you should open your case in Trial Director. Then open the following dialog:(Documents>Import New Items from>Manual Selection Dialog). An import window entitled 'Manual Selection Dialog' will then open. From here you can select (with your mouse) the documents in the briefcase and drag them onto the open Trial Director window. You will be given several options on how the documents will be named within Trial Director. When done, the documents will all be imported into Trial Director. You will find all documents under the 'Native' tab. For PDF files you will find two versions. The original will be located under the 'Native' tab, and images of each page in each document will be present in the image tab. The Trial Director software does this to facilitate page-based presentations. If you need more help, Trial Director explains this process in more detail in the Trial Director manual. Please feel free to contact Lexbe Customer Support as well.